Convert OST to PST format using OST2 conversion tool and open all Emails, Contacts, Tasks and Calendar from Microsoft Exchange in Outlook without a hassle. OST2 converts ost files created with any version of Exchange and Outlook from 2002. Use OST2 conversion tool to open damaged, corrupted and inaccessible OST file and convert to PST file to recover Exchange mailbox folders easily. 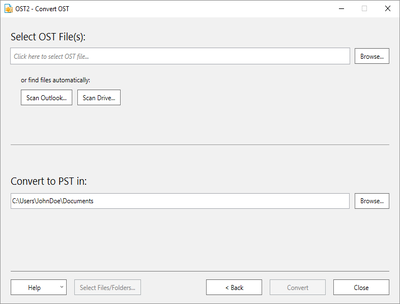 Convert OST file automatically and export selected data to PST. Back up OST to PST file format for easy restore in case of Exchange server crashed. Move the items to a new PST file for easy mailbox migration. Confirm your selection and click Convert. In just a few seconds, the OST file you have selected will be converted to a PST file.